Home/Recipes/Snack recipes/My Son is FINALLY Eating Pickled Beets! I held a workshop last week for parents who are struggling with a picky eater and I shared with them that my son …. victory! 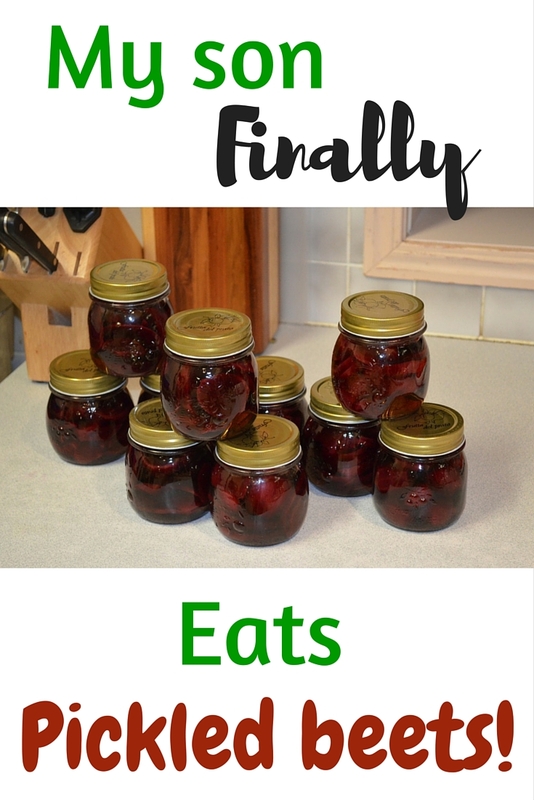 ….. is finally eating AND enjoying pickled beets. OK, you might have a few questions for me! First might be: WHY on Earth, Alina, would you want your child to eat pickled beets when there are more “normal foods” he can try? First of all, pickled beets are foods we commonly enjoy in our house. Secondly, if you have been reading my blog for a while, you might remember that my son can’t eat foods with gluten and dairy. If he can’t eat dairy, then he can’t eat yogurt, kefir, whey, and cheese. All these are fermented foods which are extremely beneficial to the gut health and overall health. So what other fermented foods are left for him to eat? Pickles, sauerkraut (still working on both of these), kimchi (various fermented vegetables), olives in brine, tempeh, natto, miso (the last 3 are fermented soy). The most common fermented foods we eat at our house are sauerkraut, pickles, olives, and pickled beets. My daughter who is 4, seems to have been born with the gene that loves pickles and pickled beets. My son, who is 7, seems to have been born with the “OMG, don’t get pickled foods near me because they will kill me!” gene. So I embarked on a journey to change that. No easy quest 😉 ! Second question you might have for me is: Alina, HOW did you convince your son to eat and enjoy pickled beets? The lack of my son’s “enjoying pickled beets” gene was not going deter me from trying to get to my goal, so each time the rest of the family ate pickled beets, I encouraged him have one bite. Just one bite. The so-called “polite bite”. Of course, each bite was accompanied by his grimaces and other uncomfortable body movements to show his complete disgust with pickled beets. But he tried and swallowed one bite each time I asked him to. He must have tried pickled beets at least 20 times, until one day, after he ate one bite, he looked at me smiling and said: “I want more”. My husband (who was also in the kitchen at the time) and I looked at each other in complete disbelief and although we usually don’t make weird remarks about foods in front of our kids, we congratulated our son on his newfound beet love. We also re-emphasized how important it is to try a food we don’t like until one day we will. That evening, my son ate lots of pickled beets and I could not have been happier. In conclusion, the polite bite and consistency on my part paid off. The plan for YOU: choose one food you would like your child to eat. Keep offering it to them each time the rest of the family eats it and have them try at least 1 bite. Research shows that it takes a child at least 10-15 tries to start enjoying a new food. It’s never too late to start your picky eater on this plan. It will pay off! I assure you. Are you ready to include the polite bite rule with your picky eater? What is one food (or foods) you wish your picky eater would eat, but doesn’t? Gosh this is SOOOO true. I can’t tell you how many times I had my son try a bite of broccoli. Now he eats it up. Thanks for sharing Alina! Yay for your son who eats broccoli! This is genius! My youngest is getting to the phase of trying to avoid any and all new foods. I’m going to try the “polite bite” idea! Love it! Yes, Cindy, the polite bite is an awesome idea. And it really works!